Is Disney attempting to rule the world? I’m asking out of sheer curiosity because it certainly seems like they are. Between Star Wars, Marvel and Pixar, Disney had no shortage of success and yet their animation studio continues to build better and better films as the years go by. Adding to their repertoire of animated features, Disney grabs another hit out of the air with Moana. An adventurous teenager sails out on a daring mission to save her people. 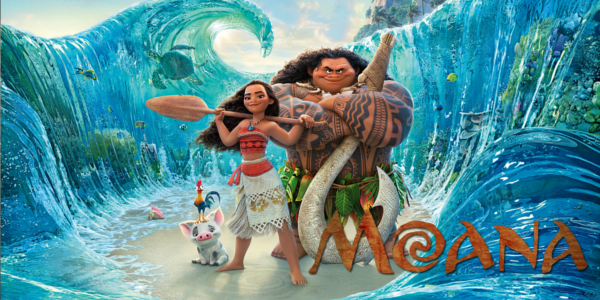 During her journey, Moana (Auli'i Cravalho) meets the once-mighty demigod Maui (Dwayne Johnson), who guides her in her quest to become a master way-finder. Together they sail across the open ocean on an action-packed voyage, encountering enormous monsters and impossible odds. Along the way, Moana fulfills the ancient quest of her ancestors and discovers the one thing she always sought: her own identity. 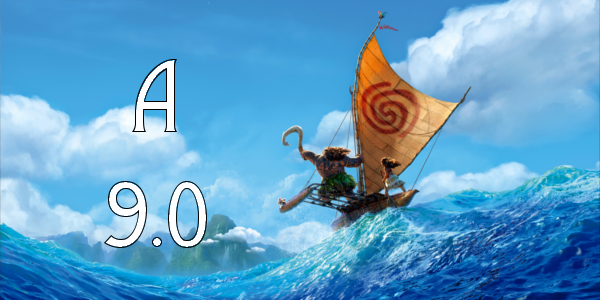 While some of the recent animated features from Disney have been different from the classics of the renaissance era of the 90s, Moana returns to that classic adventure tale. Featuring rich mythology that’s interesting in and of itself, the film is a visual treat with good characters that work well dynamically. By returning to the classic adventure, some tropes of classic Disney are there, but the charm of it all outweighs the clichés. The voice work here can really be confined to two main roles; Auli'i Cravalho and Dwayne Johnson. Auli'i Cravalho has such a wonderful voice that will certainly take her places and has a certain charming quality in her voice that makes Moana as a character completely enthralling to follow on this adventure. Not to be outdone in the charm department is Dwayne Johnson, who manages to relay his charisma and comedic timing through his voice into a comedic and heroic character in Maui. Johnson’s singing does sound iffy at times and it’s safe to say it’s been fixed somewhere along the way. Perhaps the biggest takeaway from Moana is that Disney isn’t resting on their laurels. Each and every time out, the animation looks better than it did before, becoming more realistic and tangible feeling than the last film. In this case, the real standout is the ocean, a character in it’s own right, and it’s beautifully detailed look. The design work, from characters to creatures and everything in between is original and creative while still paying so much to the culture it portrays. And the true pleasure of it all is the music by Lin-Manuel Miranda. It’s not at all surprising Disney is already working with him again, as each song is great in it’s own way with a few standing out above the rest. The music probably won’t catch on quite like Frozen did as it doesn’t have the hook of a “Let It Go”, but it is still amazing from top to bottom and expect to see a song nominated when the time comes. Overall, Moana is another fun, delightful, Disney adventure. It may not contain the same level of deep thought or meaning as Disney’s other 2016 feature, Zootopia, which I slightly favor, but it will still entertain you from start to finish. The voice work is quite good from the two leads and the music is some of the best from any Disney film in a while. There are clichés of course but they can certainly be overlooked in a film that features interesting characters and a pretty solid story, which manages to recapture some of that retro Disney spirit. So what did you think of Moana? Have you seen it, are you interested in seeing it, and what's your favorite 90s Disney film? Subscribe, share, comment below, and always return to I Am Sam for weekly reviews and insight.